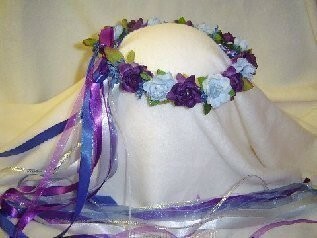 The Jessie wreath, is a fun mix of light and royal blues and purple, with black, and a little silver accent. 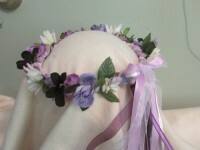 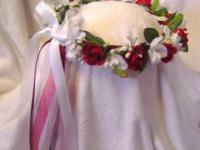 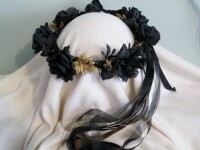 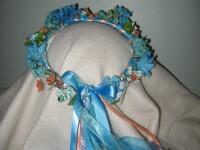 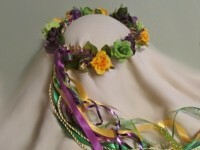 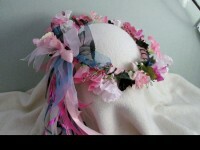 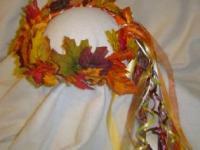 A hand crafted head wreath of silk flowers, such as pansies, wild roses, and some fall and other flowers, mixed with green leaves and a little ivy. 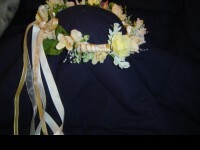 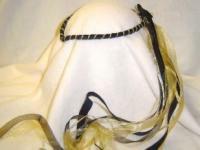 The ribbons are purple, blue, black, and silver, with a thin knotted silver cord that almost looks like a silver chain, long satin ribbon tails playfully fall from beneath the blue and purple bow. 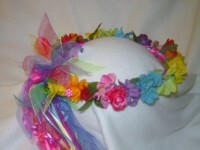 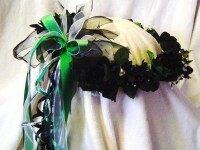 Perfect for weddings, the flower girl, bridesmaids, and of course a bride. 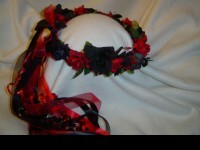 Also fun for the Renaissance fairs, and other events.